Thank you for the information. I've purchased my tickets and will be heading to the Fuji Rock Festival, mainly to see Hikashu. Maybe I'll see you there! I'm very glad of your decision, SWhite. The band recognizes the importance of the very chance and I believe they shall play great. 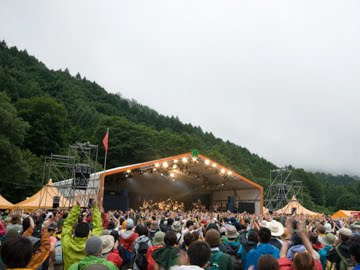 Certainly the Fuji Rock 2010 will be one of the crucial moments of the band's history. Hikashu is basically a live band, first and foremost. The CDs are great but they shine the most when playing live. And I really want people from overseas to experience the band's performance for themselves. Unfortunately, chances are very slim that they will be doing any foreign tour in foreseeable future, so right now the Fuji Rock is the best opportunity. Because, other than Hikashu, the festival has various acts of interest and offers a lot of non-musical attractions. And services in English for foreigners is readily available (unfortunately, it is not common in Japan), as I have already said. And I'd like to say it again: do not be late. The timetable is still not available but the band said they'll play very early, so I suspect their appearance will be around noon (Please be sure to confirm the timetable when available). Therefore, be in mind to come early. Bon Voyage!